A baseball game is played in the lot in front of the second Newhall School, which stood at the corner of Ninth and Walnut streets from 1890 to 1914. The school faced south, so the view is to the north. Most of downtown Newhall is out of frame to the right. Prohibitionist Henry Clay Needham provided much of the funding for the second school. Needham's money came from a syndicate headed by Kansas Gov. John St. John, who hired Needham to subdivide 10,000 acres of property that the syndicate purchased in 1887 from The Newhall Land and Farming Co. for the purpose of establishing a probition ("dry") colony. In 1891, Needham helped form the First Presbyterian Church at Newhall Avenue and Market Street on land donated by Henry M. Newhall's widow, Margaret Jane White. Prior to that time, Sunday school classes were held on the second floor of the Newhall schoolhouse (presumably in both the first building and, for a short time, the second). Instruction was provided on the ground floor of the schoolhouse and the upstairs was a hall. 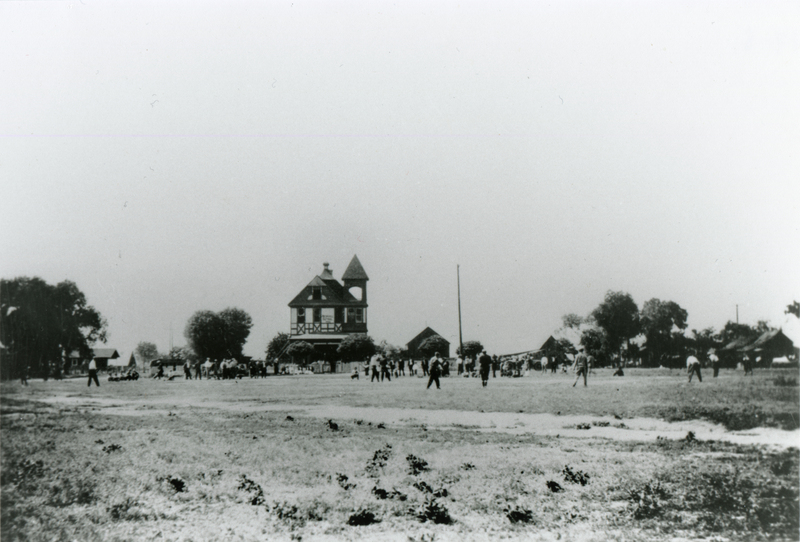 In the 1880s, the first Newhall School (also a 2-story structure) never saw more than 13 kids at any one time. Average daily attendance was 7. In the 1890s, at the second school, the student body climbed to 60 first-through-ninth graders. In 1892 a second classroom was added inside the two-story building and a second teacher was hired. Children who wished to pursue their studies beyond the ninth grade could do so after 1896, when San Fernando High School was built. After 1899, ninth graders went to San Fernando and the ninth grade was discontinued in Newhall. In 1914, the second school building suffered the same fate as the first. A third Newhall School (1914-1928) was erected on the north side of 10th Street (Lyons), west of Newhall Avenue. It was a bigger two-story structure with three rooms and a double-wide front door that opened out onto the street. At least that one didn't burn down. Instead it was outgrown in 1928 and a much larger, fourth school was built in the present Newhall School location at the northwest corner of Walnut and 11th Streets. That one burned down in 1939 and was rebuilt in place. 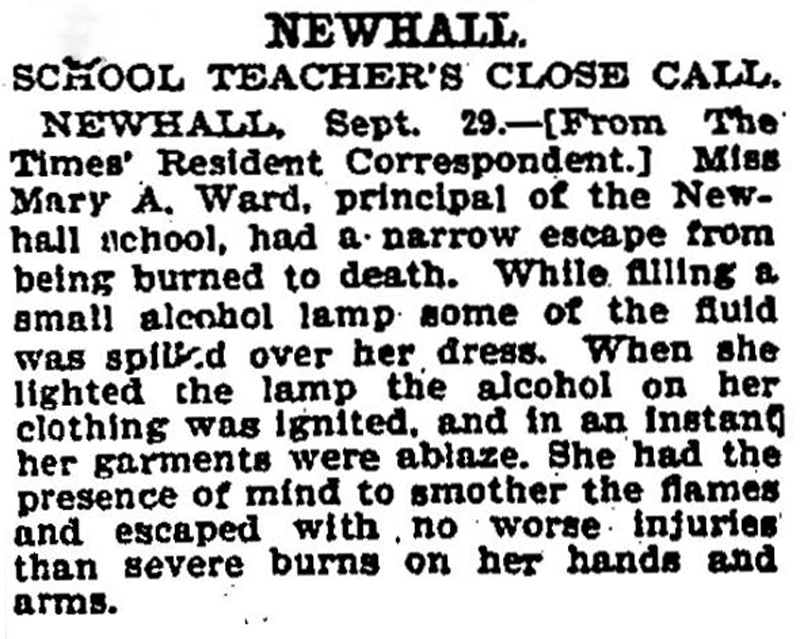 Further reading: History of Newhall School.